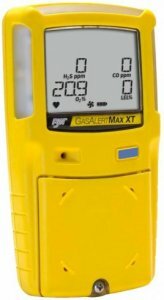 The GasAlert Max XT II portable and multi-gas detector simultaneously monitors and displays up to four gases including hydrogen sulfide (H2S) carbon monoxide (CO), new 4-series oxygen (O2) sensor - SR-X10-C1 and combustibles (%LEL). The compact and field tough GasAlertMax XT II features a non-intrusive integrated sampling pump designed for performance, reliability and ease-of-use. SmartSample pump technology improves remote sampling result accuracy and ensures a consistent, uniform flow. One-button operation guarantees ease of use even while wearing gloves. Tamper-proof, user adjustable options enable the instrument to be customized to suit your specific application. Confined space entry and remote sampling have never been so easy with new intelligent pump technology. Minimize pump blockages and improve remote sampling result accuracy. The GasAlertMax XT II is fully compatible with the MicroDock II automated test and calibration system. The Max XT II uses an improved oxygen sensor SR-X10-C1 that lasts longer and ultimately helps reduce replacement costs and down time. The older Max XT uses the SR-X-MC oxygen sensor and will not work with the Max XT II gas detector released June 2010. User field options: Startup message, lockout on self-test error, safe mode, confidence beep, latching alarm, force calibration, cal IR lock, force bump, location logging, force block test, set datalog interval, set confidence interval, language selection.